Zemlinsky’s third opera Der Traumgörge (Görge the Dreamer) is one of his least-known works. The composer completed the score of his first act, loosely modelled on Heine’s Der arme Peter, before his librettist Leo Feld and he had even decided how the story was going to continue. Once the whole work had been completed and sent to the printers, Feld made repeated revisions to his libretto – probably at the insistence of Mahler, who had agreed to conduct the premiere at Vienna’s Hofoper – forcing rewrites from the composer and the poor publisher to reprint great chunks of Act II. No sooner had the opera gone into rehearsal in the summer of 1907 than Mahler resigned his Vienna position, and his successor, Felix Weingartner, promptly dropped the work weeks before its scheduled premiere, not wishing to take the flak for a work associated with the previous regime that he predicted was going to be a failure. And there Traumgörge sat for some 70 years, unperformed, while the stoical Zemlinsky moved on to new things in the 34 years that remained to him. The opera finally reached the stage, in Nuremberg, in 1980. 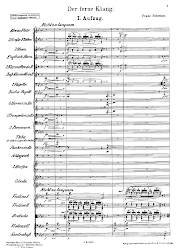 Composed in 1904-6, immediately after Der Seejungfrau, it shares that work’s Schoenbergian, late-Romantic volatility and post-Wagnerian chromaticism. Indeed, there is so much of the world of Gurrelieder – at that time incomplete – in its melodies, harmonies and orchestration, that it gives credence to the theory that Schoenberg sourced his early musical language from Zemlinsky – his teacher and brother-in-law – rather than the other way round. It was Zemlinsky who took Schoenberg to the portal of atonality and left him there to go through, while backing away himself. This process on Zemlinsky’s part more-or-less happens in Der Traumgörge itself. The music of the two acts is different in character, to suggest the competing worlds of fantasy and reality that drive the plot. Act I is Zemlinsky at his lushest, as he sets up the dream-world in which his protagonist, Görge, lives; Act II is harder edged, more angular, to evoke the harsher, real world – indeed, the contrast is very similar to the stylistic divide between Parts 1 and 3 of Gurrelieder, the result of that work’s composer’s own advance over the ten years or so of its composition and orchestration. Zemlinsky’s Epilogue, originally conceived as an Act III, brings the two musical worlds back together again. Staatsoper Hannover’s new staging, only about the fifth in the opera’s history, is a musical and dramatic triumph. From the first sounds that emerged from the pit it was evident that conductor Mark Rohde and the Niedersächsisches Staatsorchester Hannover had fully absorbed the idiom. Textures were beautifully balanced and Zemlinsky’s leitmotivic play of themes allowed to evolve in their own, ear-catching way. 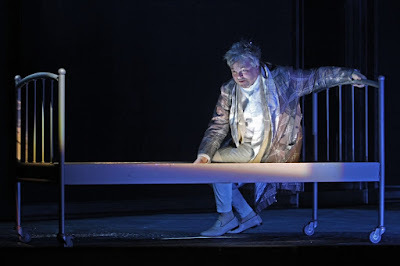 The role of Görge is a demanding one, both in terms of range and length, but Hannover’s resident Heldentenor, Robert Künzli, was tireless and made light work of it, and his acting of the dreamer was convincing and sympathetic. 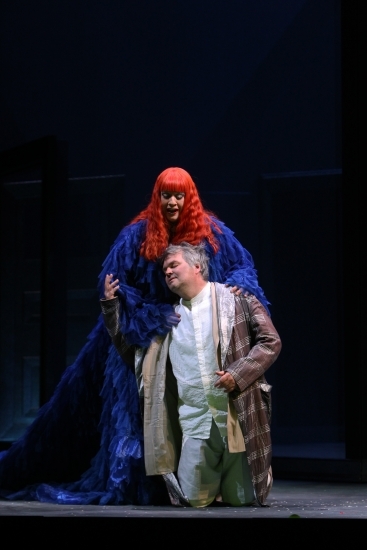 Kelly God’s Gertraud had a wonderfully full sound to her voice, both Solen Mainguené’s Grete and Dorothea Maria Marx’s Princess provided ample timbral contrast and Christopher Tonkin’s suavely sung, full-of-himself Hans stole every scene he was in. 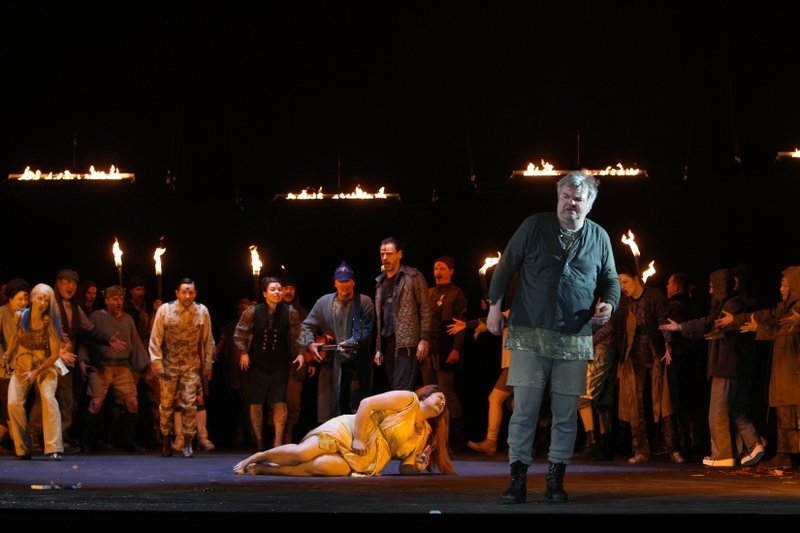 There was barely a weakness among the smaller roles and the Staatsoper Chorus sang with appropriate fire in the dramatic crowd scenes. Johannes von Matuschka, a young German theatre director making his operatic debut, plays with the plot’s idea of dreams – this is after all a work composed in the Vienna of Freud – and sets the whole of Act I as a work of Görge’s somnolent imagination. Görge himself is a bookworm, with an unhealthy fixation on fairy stories, and their characters haunt his mind and rule his actions, despite the pressure from Grete, whom his father has insisted he marry, and the taunts from his rival Hans, whose show of manliness is perhaps one detail that von Matuschka takes a little too far in his attempt to show up his contrast with the dreamer. Left alone, Görge conjures up an image of his ideal princess, who appears to him in his dream, and the act ends with him proclaiming his motto, ‘fairytales must come alive’, as he runs from his impending marriage. Von Matuschka peoples the stage with fantasy figures, and emphasises the Freudian undercurrents with Gorge’s apparent confusion of his ideal wife and his mother. A constant in David Hohmann’s designs is a bed: Görge’s home and comfort, to which he retreats from the harshness of reality. Meanwhile, the set itself is composed of walls made of gauze that underline the real/surreal worlds that the characters inhabit, allowing for mysterious comings and goings and, at the end of the first act, a magical effect as the whole room encompassing the princess floats up into the fly tower. Act II is based on a different fairytale, Vom unsichtbaren Königreiche (From Unseen Kingdoms) by Richard von Volkmann-Leander, and was conceived at a time when Zemlinsky personally felt the growing anti-Jewish feeling in Vienna (Mahler’s departure from the Hofoper was but one result). It reveals Görge as an outcast in a different village, where he is singled out for his difference. Also suffering the bigotry of the religiously hardline community in which he has found himself is Gertraud, a woman whom the people condemn as a witch and in whom Görge finds a kindred spirit. In her he thinks he has at last found his princess, and they escape the flame-wielding populace. Von Matuschka makes no bones about the violence that the religious use to inflict their conformity on these misfits, while downplaying the political dimension that is there in the libretto, where the populace are fomenting revolution against their repressive landowners. The act’s climax, where Whitsun fire threatens to consume all and sundry, is impressively staged. In the Epilogue, back in Görge’s home village, Grete and Hans are a bickering married couple and, in von Matuschka’s reading, our hero, now supposedly married to Gertraud, is seen to have dreamt the whole episode and he dies – or falls asleep again – heartbroken. Here, the gauze cube of Hohmann’s set design comes into its own as it descends again to enclose everyone but Görge in the world of his dreams. From the libretto alone, it’s possible to read the ending as either tragic or blissful, with its repeated ‘Let us dream and play’, but Zemlinsky’s music makes it clear – and this production rightly picks up on it – that happiness does not come from dreams alone.